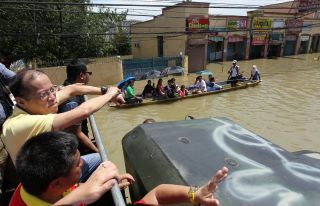 What caused the massive flooding in the provinces of Central and Northern Luzon, several of which remain submerged more than a week after typhoons Pedring and Quiel left the country? Elderly village folks in affected areas swear that they have not seen such flooding before, that what happened was abnormal. For this, the catch-all explanation of the Department of Science and Technology (DOST) is climate change. “What we consider as abnormal we should now consider as normal,” its undersecretary was quoted as saying. But the Aquino administration assures the public that it is proactively dealing with the issue of climate change. In fact, President Benigno S. Aquino III has made Climate Change Mitigation and Adaptation as one of the five Cabinet clusters that will implement his programs until 2016. In Aquino’s proposed 2012 budget, P36.2 billion is allocated for climate change adaptation and mitigation activities. Ironically, however, the Aquino administration also continues to promote programs that aggravate the vulnerability of the country to the adverse impact of climate change. One example is large-scale mining, which is among the priority areas of government’s Philippine Development Plan (PDP) 2011-2016. While the PDP talks about linking the mining industry to the domestic production of manufactured goods and industrial products, its ultimate goal is to double the sector’s exports by 2016. The importance that Malacañang gives to the mining industry as among the sectors with the “highest growth potentials and generate the most jobs” explains its strong reaction to the simultaneous attacks on three mining firms in Surigao de Norte last Oct. 3 by the New People’s Army (NPA). The rebels cited the serious harm to the environment being inflicted by the large-scale mining operations in the province as one of the main reasons for staging the attacks. Mining contributes to both the cause and effect of climate change. The Philippines is considered one of the most mineralized countries in the world (third in gold, fourth in copper, fifth in nickel) due to its location along a belt of volcanoes in the Pacific. According to the Mines and Geosciences Bureau (MGB), an estimated “nine million hectares of the Philippine total land area of 30 million hectares are geologically prospective for metallic minerals”. But much of these areas lie underneath the country’s forests, which have to be cleared to extract the minerals, resulting to massive deforestation. It has been reported that the Philippines ranks number three in the world (behind Honduras and Nigeria) with the fastest deforestation rate. The Center for Environmental Concerns (CEC) Philippines, citing government data, said that the country’s forest cover is just about 18% of the total land area. Together with corporate logging, large-scale mining is behind the significant deforestation in the country. The forest cover in the town of Claver in Surigao del Norte, where the target of the recent NPA offensive –Taganito Mining Corp. (TMC), Taganito HPAL Nickel Corp., and Platinum Group Metals Corp. (PGMC) are operating – is just one in a long list of forests denuded by large-scale mining. 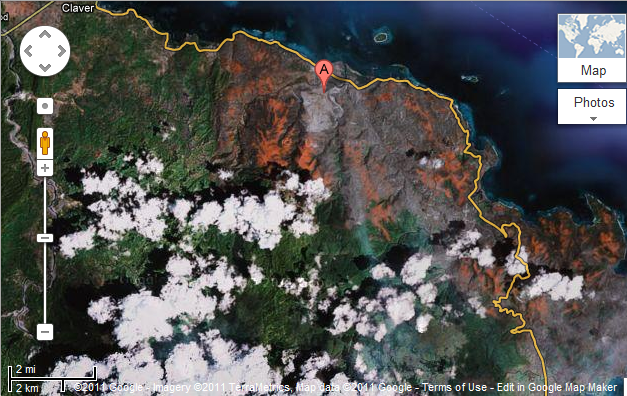 Generated through Google Maps, a satellite image of Claver where TMC operates shows a vast portion of the mountains in reddish hue, indicating massive deforestation. A recent documentary by the GMA’s “Reporter’s Notebook” also presented the extent of environmental damage, including deforestation, caused by the mining operations in Claver as well as in Surigao del Sur. The GMA report said that the massive mining in Claver has almost leveled the mountains with the extracted minerals being exported to Australia, China, and Japan for processing. Of course, the amount of GHG emissions of the Philippines, including from deforestation, is dwarfed by the emissions of the world’s largest industrial countries. The US alone accounts for 25% of historical GHG emissions, according to the Friends of the Earth (FOE). Furthermore, much of the GHG emissions of poor countries actually come from the operation of First World companies plundering the natural resources of poor countries such as in the case of the Claver mines where Japanese giant mining company Sumitomo Metal Mining Co. has stakes in the TMC and Taganito HPAL Nickel Corp. Nonetheless, it does not downplay the incoherence in the Aquino administration’s proclaimed environment-conscious medium-term plan and its avowed promotion of supposed “development” programs that worsen climate change such as large-scale mining. Another way that large-scale mining aggravates flooding is the siltation of rivers. One source of sediments are the tailings disposed by mining companies in rivers such as in the case of the Abra River that according to the Cordillera People’s Alliance (CPA) has become heavily silted because of the tailings disposal of Lepanto Consolidated Mining Company. As a consequence, an estimated 465 hectares of riceland have been washed out, the CPA claimed. Experts have also attributed the heavy flooding in Centra Luzon, aside from the ill-timed release of water from privatized dams, to the siltation of rivers due to denuded mountains in the region, which also hosts a number of mining operations. Contrary to the common notion, climate change is not a recent concern of the government. In fact, the Philippines was among the first to recognize, at least on paper, climate change as a phenomenon and the urgent need to address its causes and mitigate its impact. As early as 1991, Noynoy’s mother, the late President Cory Aquino has already created the Inter-Agency Committee on Climate Change (IACC) through Administrative Order (AO) No. 220. The Philippines was also among the first to ratify the United Nations Framework Convention on Climate Change(UNFCC), which it did in 1994. These initiatives suffer from basic defects such as the promotion of market-based mechanisms to mitigate climate change (e.g. allowing rich countries to buy cheap emission credits from poor countries which allow industrial countries to evade their responsibility to cut down their own emissions) as well as low emission reduction targets. Worse, as a result of lobbying and pressure from First World corporations and financial institutions and their local agents, Third World countries like the Philippines continue to implement programs that allow the wanton corporate plunder of natural resources and enormous destruction of the environment. A year after ratifying the UN agreement on climate change, for instance, the Philippine Congress passed the Philippine Mining Act of 1995 or Republic Act (RA) 7942, which liberalized and consequently intensified large-scale mining in the country. → Who’s afraid of Occupy Mendiola? You are right, Arnold. Thanks for posting this blog. May more eyes be opened, especially the eyes of our oligarch government leaders, members of the Chamber of Mines, business people, and global leaders.